We write to thank you for refusing to accept Israeli sponsorship of the Jewish Film Festival. We particularly appreciate that you distinguish between Jews in Britain and the Israeli State. We could not be further apart from the Israeli state. 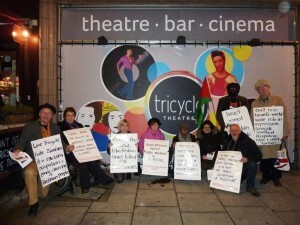 The insistence of the organisers of the UK Jewish Film Festival on including sponsorship from the Israeli Embassy, even when you generously offered an alternative, has made their priorities clear: not Jewish people or Jewish film but the hijacking of Jewish culture to disguise Israeli policies and particularly its bloodied image. Its murder and maiming of Palestinians and others in the Middle East has been going on for many decades. But its recent unrestrained, sadistic attack on Gaza has reinforced its genocidal intentions against the Palestinians. We are particularly appalled as Jews that our suffering as a people is the occasion and the excuse for the genocide of others. We are aware of the suffering of others, which is why we have said, unlike Zionists: Never again – for anyone. Including of course Tamils in Sri Lanka, about which you would be familiar. Those of us who were part of the demonstration in front of the Tricycle last November against Israeli sponsorship of the UKJFF, which was led by the International Jewish Anti-Zionist Network, welcome this decision of the Tricycle to respect the multi-racial nature of the community of which it is part, by refusing blood money from apartheid Israel. We are a group of Jews in Britain including from Israel and are appalled that you have been subjected to false accusations of anti-Semitism. Zionism cynically uses the sufferings of Jews to silence critics of the Israeli genocide of Palestinians. This is an abhorrent attempt to intimidate a local theatre for refusing to be enlisted to serve the Israeli State, in order to camouflage its most recent assault on hospitals, UN schools in which thousands were sheltering, children, and civilians of all ages. We take this opportunity to share with you a few examples of how Israel harnesses culture as a propaganda tool. 1) Israeli artists who receive government sponsorship are contractually obligated to promote the state as a condition of their sponsorship, which includes Israeli films that are promoted as being critical; but while they might show some criticism their overall message is to present Israel as a democracy and camouflage its apartheid. In short, any event accepting sponsorship from the Israeli Embassy or from any other Israeli state bodies is legitimising the Israeli apartheid, ethnic cleansing and its genocidal attacks on the Palestinians, including the Gaza Strip that Israel turned into a concentration camp. We value the Tricycle and as your loyal supporters, your audience, we ask that you will not renew your association with Israel, as long as it violates international law, and until the 3 conditions set out in the Palestinian call for boycott demanding Israel meets its obligation and comply with international law. (see http://www.pacbi.org/etemplate.php?id=1801).